Home > Current Buzz > Joel Malina, FAME's 1st Schlomo, inspires Cast @ State Theatre in Ithaca, NY. 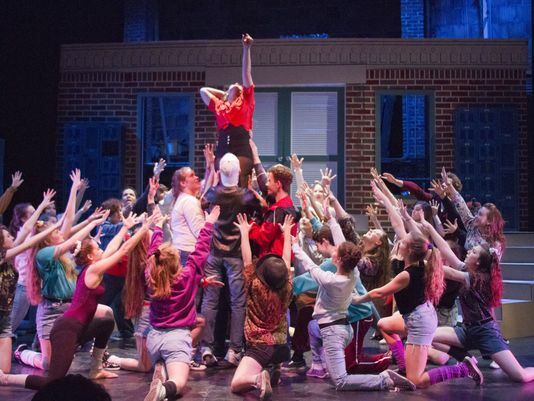 Funny, sad, angry and heartrendingly beautiful, the Running to Places (R2P) production of "Fame: The Musical" has all the highs and lows of real teenage life. "Fame" — running Friday through Sunday at the State Theatre of Ithaca — follows students' four years at the High School of Performing Arts, among them fame-obsessed Carmen (Ilana Wallenstein), ambitious actors Serena (Elisheva Glaser) and Nick (Michael Sloan), wisecracking comedian Joe (Matthew Skrovan), earnest composer Schlomo (Max Avramis), and talented dancers Tyrone (Christian Henry), Iris (Kamryn Phlegar) and Mabel (Laura Fegely). Teachers, including Ms. Bell (Lisa Podulka) and Ms. Sherman (Jewell Payne) try — and sometimes fail — to educate and guide. Central to this production is the dancing, choreographed by two very different local artists: Fatima Sowe, like "Fame" character Ms. Bell, is classically trained; G-Quan Booker, like Tyrone, is a self-taught hip-hop artist. The show deals honestly with issues of drug use and abuse, sexuality and race, and it contains some adult language. A visit by Joel Malina, Cornell's vice president of university relations, who played Schlomo in the original pre-Broadway production of "Fame," motivated the cast to new heights, said Steinhagen. "Hearing him talk about what it was like to stage the original show gave the company extra inspiration. The production is full of incredible singing and passionate moments." The design team includes Deb and Jim Drew, set design and build; Anna Grigo, an Ithaca College senior, costumes; Jeremey Pletter, resident music director; Dan Paolangeli, sound; and Mike Garrett, lights and mentor to stage manager Sophia Tantillo, a Trumansburg High School sophomore. "Fame" — the first show R2P ever did — was chosen for revival because it's about teenagers discovering themselves as they pursue the arts, "which after all is what R2P is about," Steinhagen said. "And 'Fame' sends an important message, that R2P doesn't offer typical high school fare. The show is challenging and complex." Like "Fame," the rest of R2P's 2015 season features shows with strong female characters. "Daisy Pulls It Off," the February production, is a Harry Potter-like adventure without the magic and with Hermione as the lead. "It's the best show you never heard of," Steinhagen said. This is R2P's first season with company participation entirely free to the actors. "It's palpable to me that there's a different energy with this show," Steinhagen said. "There are lots of new kids who said they always wanted to do R2P but couldn't because it wasn't free. We're really grateful to the community, which is making the new tuition-free model possible." Donations can be made online at www.runningtoplaces.org. Tickets are $15 the day of the show ($13 if purchased in advance), available at the State Theatre box office at 105 W. Martin Luther King Jr. St., by calling 277-8283, and at www.stateofithaca.com. For more information, visit www.runningtoplaces.org.